To obtain more sensitivity during low force testing, smaller capacity load cells are used. 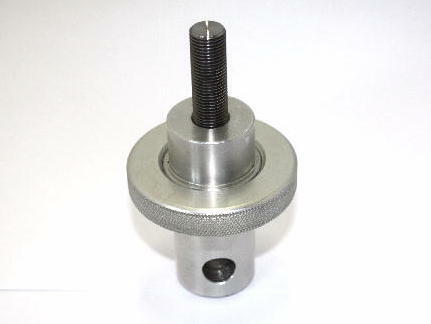 In many cases the standard steel adapter with the grip use most of the load cell capacity. MTT offers a low force aluminum version of the standard male clevis adapter to reduce the total load on the load cell. The male clevis end of the adapter is made to industry standard size and will fit most makes of testing machines. The aluminum male clevis is supplied with a locking nut and the lite male clevis is supplied without a locking nut to further reduce weight. 1/2" - 13 x 1.0" 1/2" - 20 x 1.0" 5/8" - 18 x 1.5" 3/4" - 16 x 1.5" 1" - 14 x 2.0"
M01S20AL 150 1/2" 3/16" 1/2" - 13 x 1.0"
M01S21AL 150 1/2" 3/16" 1/2" - 20 x 1.0"
M01S27AL 150 1/2" 3/16" 5/8" - 18 x 1.5"
M01S30AL 150 1/2" 3/16" 3/4" - 16 x 1.5"
M01S36AL 150 1/2" 3/16" 1" - 14 x 2.0"
M02S20AL 250 5/8" 1/4" 1/2" - 13 x 1.0"
M02S21AL 250 5/8" 1/4" 1/2" - 20 x 1.0"
M02S27AL 250 5/8" 1/4" 5/8" - 18 x 1.5"
M02S30AL 250 5/8" 1/4" 3/4" - 16 x 1.5"
M02S36AL 250 5/8" 1/4" 1" - 14 x 2.0"
M03S20AL 400 1.25" 1/2" 1/2" - 13 x 1.0"
M03S21AL 400 1.25" 1/2" 1/2" - 20 x 1.0"
M03S27AL 500 1.25" 1/2" 5/8" - 18 x 1.5"
M03S30AL 500 1.25" 1/2" 3/4" - 16 x 1.5"
M03S36AL 500 1.25" 1/2" 1" - 14 x 2.0"
M12S20AL 250 12mm 6mm 1/2" - 13 x 1.0"
M12S21AL 250 12mm 6mm 1/2" - 20 x 1.0"
M12S27AL 250 12mm 6mm 5/8" - 18 x 1.5"
M12S30AL 250 12mm 6mm 3/4" - 16 x 1.5"
M12S36AL 250 12mm 6mm 1" - 14 x 2.0"
M01S20L 150 1/2" 3/16" 1/2" - 13 x 1.0"
M01S21L 150 1/2" 3/16" 1/2" - 20 x 1.0"
M01S27L 150 1/2" 3/16" 5/8" - 18 x 1.5"
M01S30L 150 1/2" 3/16" 3/4" - 16 x 1.5"
M01S36L 150 1/2" 3/16" 1" - 14 x 2.0"
M02S20L 250 5/8" 1/4" 1/2" - 13 x 1.0"
M02S21L 250 5/8" 1/4" 1/2" - 20 x 1.0"
M02S27L 250 5/8" 1/4" 5/8" - 18 x 1.5"
M02S30L 250 5/8" 1/4" 3/4" - 16 x 1.5"
M02S36L 250 5/8" 1/4" 1" - 14 x 2.0"
M03S20L 400 1.25" 1/2" 1/2" - 13 x 1.0"
M03S21L 400 1.25" 1/2" 1/2" - 20 x 1.0"
M03S27L 500 1.25" 1/2" 5/8" - 18 x 1.5"
M03S30L 500 1.25" 1/2" 3/4" - 16 x 1.5"
M03S36L 500 1.25" 1/2" 1" - 14 x 2.0"
M12S20L 250 12mm 6mm 1/2" - 13 x 1.0"
M12S21L 250 12mm 6mm 1/2" - 20 x 1.0"
M12S27L 250 12mm 6mm 5/8" - 18 x 1.5"
M12S30L 250 12mm 6mm 3/4" - 16 x 1.5"
M12S36L 250 12mm 6mm 1" - 14 x 2.0"